Physics Buzz: What happened to my battery? If you've ever wondered why the battery life of your iPod or laptop flatlines after a few years, rest assured: scientists are on it. Physicists at Brookhaven National Laboratory have developed advanced imaging techniques to find out how and why lithium batteries steadily degrade over time. The research, published in the journal Nature Communications, presents real-time videos of the lithium ion reaction in rechargeable lithium batteries. Lithium ions gradually destroy material in batteries. 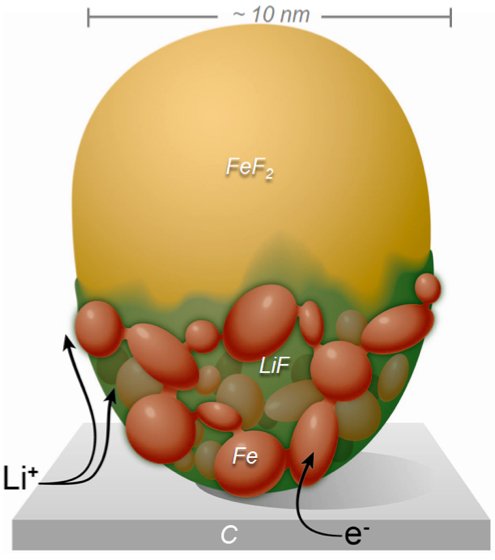 the nanoparticle into iron crystals and chunks of lithium-fluoride. "The live, nanoscale imaging may help pave the way for developing lasting, higher-capacity lithium-ion batteries," the lead author Feng Wang told Brookhaven National Laboratory press, "That means better consumer electronics, and the potential for large-scale, emission-free energy storage." As a lithium battery discharges, lithium ions move from a negative electrode to a positive electrode, driving a current through the external device (e.g. your iPod). Recharging the battery drives the ions back to the negative electrode. The problem is that the lithium ions actaully degrade the material in the electrodes, eventually killing the battery. For the past couple years, scientists have been studying the atomic interactions of this lithium ion reaction using transmission electron microscopy (TEM). The images generated by TEM depend on the electrons that can pass through the sample, much like light through an optical microscope. Less dense areas transmit more electrons while more dense areas of the sample transmit fewer, building a detailed image with information about structure, size, and density. The scientists at Brookhaven have developed a method of TEM that works in real time, allowing them to watch as lithium ions degrade nanoparticles made out of a model electrode material of iron and fluoride. In the video published alongside the paper, you can watch the material degrade-- starting rapidly at its surface and then undergoing a slow phase separation into iron crystals alongside chunks of lithium-fluoride. The scientists hope that observing how lithium ions destroy electrode material will enable researchers to address the degradation that takes place in almost all electrodes and engineer new materials and energy storage cells. As scientists look to scale energy storage to accomodate electric cars and grid-scale storage, addressing this irreversible electrochemical process may transform the next generation of energy storage devices.